Films don’t get much bigger than “Star Wars,” so we are excited to bring the latest from the celebrated franchise to TDS TV on Demand. 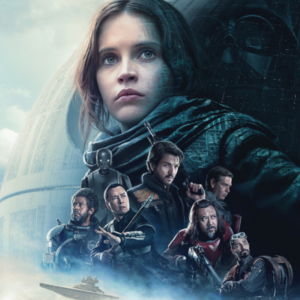 “Rogue One: A Star Wars Story” was the biggest film of 2016, racking up sales of over $530 million for the year. But intergalactic action is not the only thing on the docket. There’s the war film “Mine” for those in the mood for some tense thrills. And if you like critically acclaimed movies, check out the international drama “Lion,” as well as the low-key “Paterson”—the latter from cult film maker Jim Jarmusch. If all that seems a bit serious, then go to “Office Christmas Party” to lighten up your mood. Available April 4. Rated PG-13. The “Star Wars” universe gets its darkest, grittiest tale yet. “Rogue One” takes place immediately before the 1977 original, and tells the dramatic story of those who risked their lives to acquire the plans to the Death Star. Felicity Jones commands the film and she’s aided by a strong supporting cast, including Diego Luna, Alan Tudyk, Donnie Yen, Wen Jiang, Mads Mikkelsen, Riz Ahmed and many others. “Rogue One” is an excellent film—intense and action-packed with amazing effects. But it is different than other “Star Wars” movies. “Rogue One” is more of a war film than a space opera (there’s nary a Jedi in sight), focusing on the ordinary men and women (and aliens) fighting the Galactic Empire. The title pretty much describes this film. “Office Christmas Party” is the latest low-brow comedy that relies heavily on crude and lewd to win laughs. And to its credit, the film is not afraid to push the envelope. “Office Christmas Party” is helped by an accomplished cast, including Jennifer Aniston, Jason Bateman, Olivia Munn, T.J. Miller, Kate McKinnon and Courtney B. Vance. Our advice? Watch the trailer and if it looks like your kind of flick, then don’t miss the party. “Paterson” is what you’d call a small film. It meanders along a path at its own pace and its own direction resulting in a sweet, quiet film that rewards those looking for something a bit different. Directed by cult filmmaker Jim Jarmusch, “Paterson” is about a bus driver (Adam Driver) in Paterson, New Jersey, who observes and writes about the simple triumphs and defeats of everyday life. There are no explosions or aliens—just an honest and heartfelt view of humanity. While “Mine” is about an American marine in the Middle East, it’s more of a drama than a war story. The film is about a soldier stranded in the desert after a mission goes awry. The catch—he steps on a mine and can’t take is foot off of it without being killed. The marine, nicely played by Armie Hammer, must endure 52 hours of psychological and physical trials in order to emerge alive. Available April 11. Rated PG-13. Excellent film about a five-year-old boy separated from his family in Calcutta. The film details the boy’s struggle to survive and then his eventual adoption by an Australian couple. Jump forward 20 years, and the grown boy (played by Dev Patel) begins an emotional search for the family that he lost decades earlier. Based on a true story, “Lion” is an emotional and moving human drama. The cast includes Patel, Rooney Mara, Nicole Kidman, David Wenham and Sunny Pawar.